“Nothing compares to the simple pleasure of riding a bike." Transportation, recreation, exercise and sport. Cycling means different things to different people. But most of all, cycling means better health. For us, improved physical and mental health. For the environment, a cleaner mode of transportation. Our goal is to improve both community heath and the environment through safer cycling, including better bike routes to work and shopping areas. Ride along with us. Biking is for recreation and exercise, but also for transportation. 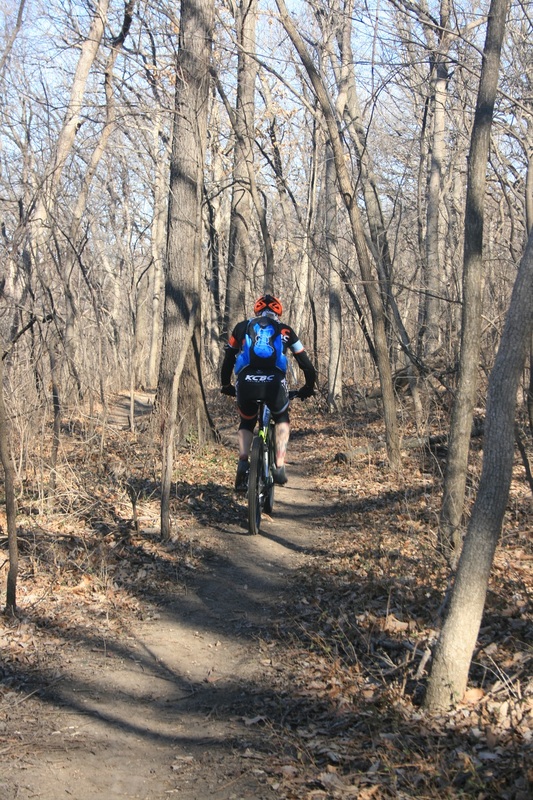 The Rozarks Trail in Rosedale attracts trail bikers and group from across the greater Kansas City area. Helmets are provided, checked for size and properly adjusted at the 2015 Bike Rodeo in Rosedale. 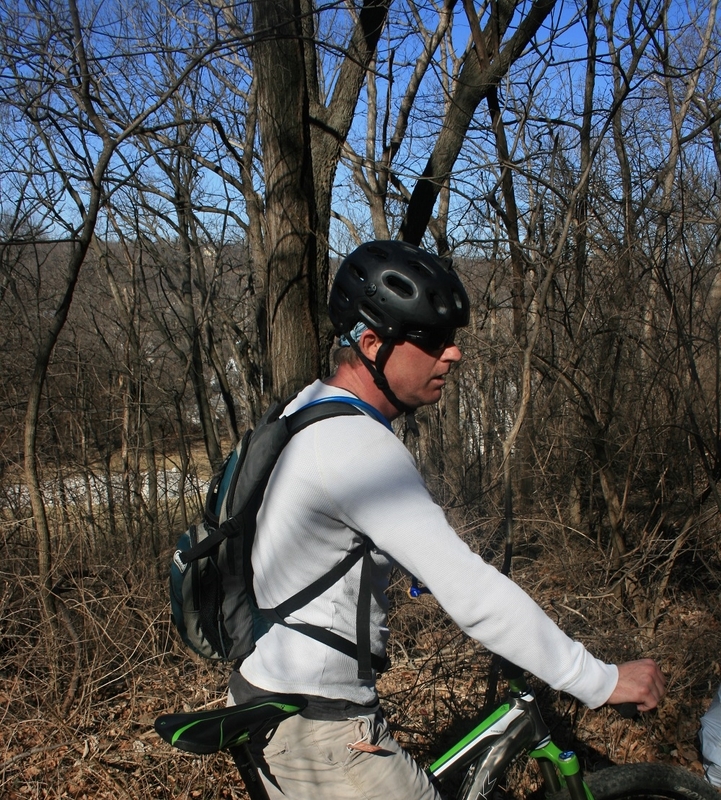 Friendly Trail Biker stops to chat with us on the Rozarks Nature Trail. This is a combined use trail for biking and hiking. Not all bicycles need to be expensive. Thanks to Revolve KC there are other alternatives, and recycling is good for the environment too. Sometimes there are groups of cyclists. This seems to be a day for individual bikers - perhaps practicing for future competitions. Not a strange bicycle, or a piece of metal scupture. This kind of creative bike rack design at the Wyandotte County health Department creates additional interest. 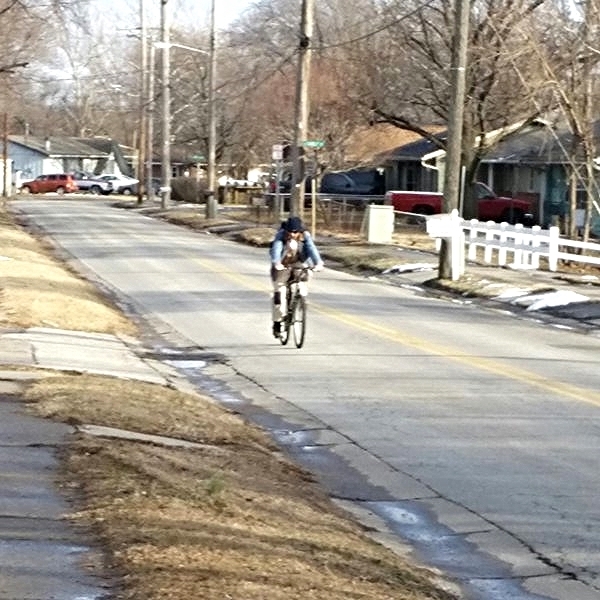 Neighborhood cyclist on Shawnee Road - a frequent road route for cyclists. Don't be deceived by the sunshine. Cold windy morning. This is a route for both hikers and cyclists, parts of which include scenic views of the river.